Alexander Taylor is about to embark on a journey of a lifetime. 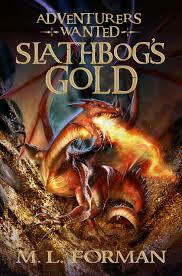 This book puts the reader in the mind of Alexander Taylor (or Alex for short) as he is about to enter the lair of Slathbog the red dragon as he is about to finish his quest. The reader gets transported back to modern day New Hampshire with him working for his stepfather in the Happy Dragon tavern. He then punished for being tripped by his stepbrother and breaking glasses even though it wasn’t his fault. After a while he decides to walk down to the bookstore, but as he is passing it everybody disappears and he sees a sign in the window that says “Adventurers Wanted Apply Within.” As he rubs his eyes to see if this is all dream it changes. He walks into the bookstore and asks the owner what is happening but this owner is slightly unusual. The owner looks at Alexander and brings him to the back room of the store and asks him if he wants to embark on an adventure. Alex says yes thinking this is all a joke or hidden camera prank show and the owner brings him to a waiting room where he is questioned about experience as an adventurer. Then he is put into an adventuring party and transported to a magical medieval world where he meets meets with the party, and is dragged on a can’t put down thrill ride that you will not want to stop reading. In my opinion if you like Harry Potter, Percy Jackson and the Olympians, or Lockwood and co then you will love this book and the writing style from the start. As I noticed while I was reading this book, there were some scenes that were either really amazing or extremely exciting but there was some meaning in all of the scenes with other deeply felt touching scenes sprinkled around the book. Some of the scenes like other books were for setting up the back\forth story and foreshadowing as to why his life has never been normal in the first place. The author also included some backstory at the start so people can kind of get to know Alex and this author has created a book that grabs you and won’t let go until you’ve finished every one written in the series.